TUA Engineering was founded by Ing. Arthur Tua in 1998 primarily to provide professional consulting services in the field of membrane desalination based on the knowledge gained in this field by the founder himself. Over the years the company has diversified and started manufacturing a number of products including large GRP -fibreglass filter vessels, industrial reverse osmosis units, softening systems, static mixers, filtration systems amongst others. In addition, as the industrial applications is our main focus we strive to cater for unique requirements coming from our clients. 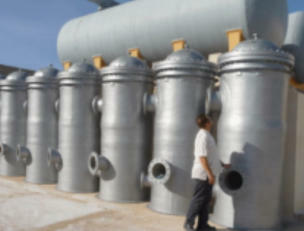 We have implemented various projects for grey water recycling as well as other specific requirements of water treatment. TUA Engineering evolved to become a leading solution package in handling most of water treatment problems. Our team is made up of a group of specialists that develop, manufacture, and assembly and commission all water treatment systems. In addition we offer professional consultations and various inhouse testing. Our Mission is to effectively develop tailor made water treatment solutions that provides quality water supply that meets the customer needs. Our Vision is to be key leader in the industrial water treatment systems locally and internationally. TUA Engineering was founded by Ing. Arthur Tua in 1998 primarily to provide professional consulting services in the field of membrane desalination based on the knowledge gained in this field by the founder himself. Over the years the company has diversified and started manufacturing a number of products including large GRP - fibreglass filter vessels, industrial reverse osmosis units, softening systems, static mixers, filtration systems amongst others. In addition, as the industrial applications is our main focus we strive to cater for unique requirements coming from our clients. We have implemented various projects for grey water recycling as well as other specific requirements of water treatment. TUA Engineering evolved to become a leading solution package in handling most of water treatment problems. Our team is made up of a group of specialists that develop, manufacture, and assembly and commission all water treatment systems. In addition we offer professional consultations and various inhouse testing.